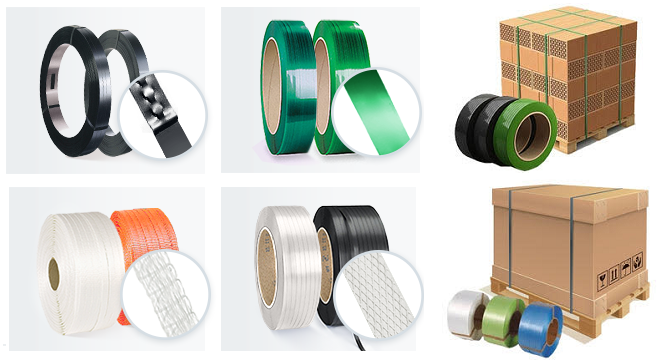 Steel Strapping - For the most heavy duty applications where the holding power is the main concern. PET Strapping - Medium-high holding strength, provide minimum damage to the load. Cord Strapping - Similar holding strength as steel strapping, but safer to handle (Can be re-tightened). PP Strapping - For light duty applications such as individual boxes, mostly used with table-top strapping machines. Woven cord strapping 3900 feet per roll650 lbs. break strength6" x 3" core ..
Light and versatile, contours and molds to odd-shaped or irregular packages9000 feet per coil300 lbs.. Suitable for semi-automatic and automatic machines9900 feet per coil300 lbs. break Strength, 8" x 8"..
Hand grade 5800 feet per coil725 lbs. break strength16" x 6" core..
Hand grade 4000 feet per coil1400 lbs. break strength16" x 6" core..
1640 feet per roll2425 lbs. break strength6" x 3" core .. Regular duty steel strapping 2940 feet per coil1200 lbs. break strengthOscillated wound..
1312 feet per coil1730 lbs. break strength 8" x 8" core .. Regular Duty steel strapping 1960 feet per coil1800 lbs. break strengthOscillated wound..
820 feet per coil 3300 lbs. break strength 8" x 8" Core .. Heavy Duty steel strapping 1570 feet per coil 2800 lbs. break strengthOscillated wound..
High Tensile steel strapping coil5500 lbs. break strengthRibbon wound..